Word occurring in different passages of the Bible, sometimes in the singular form, sometimes in the plural, , and once in the status constructus, . It means "flood" (Isa. xxvii. 12; Ps. lxix. 3, 16) or "ear of corn" (Job xxiv. 24; Gen. xli. 5, 6; Isa. xvii. 5; Ruth ii. 2) or "branch" (Zech. iv. 12). The main interest in this word centers in its use in Judges xii. 6, in which passage any other word beginning with "sh" would have served as well (Ḳimḥi supposes that other words were actually used, "shibboleth" being but a typical instance; see G. F. Moore, "Commentary on Judges," p. 308). After the Gileadites had defeated the men of Ephraim, the conquerors took possession of the fords of the Jordan, with the view of cutting off the retreat of the fleeing Ephraimites. When a fugitive came to the ford and said, "Let me cross," he was asked, "Art thou an Ephraimite?" If he answered "No," the Gileadites put him to a test. "Say 'Shibboleth,'" they demanded; and if he pronounced the word "Sibboleth," this at once betrayed him as an enemy. 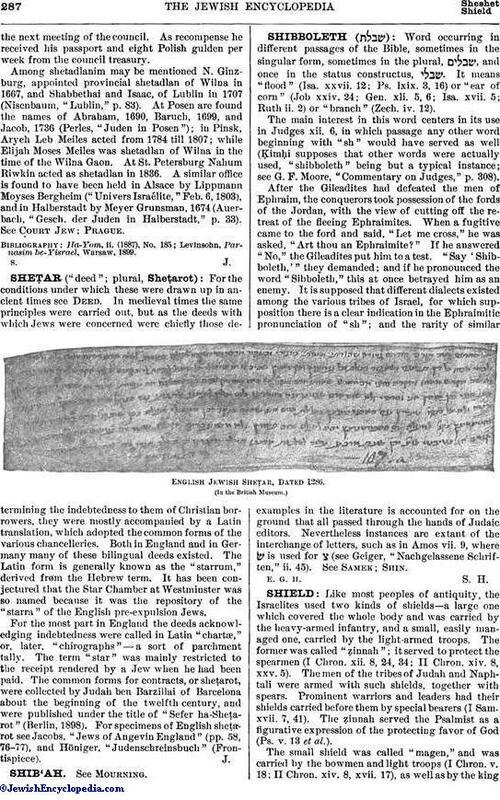 It is supposed that different dialects existed among the various tribes of Israel, for which supposition there is a clear indication in the Ephraimitic pronunciation of "sh"; and the rarity of similar examples in the literature is accounted for on the ground that all passed through the hands of Judaic editors. Nevertheless instances are extant of the interchange of letters, such as in Amos vii. 9, where ש is used for צ (see Geiger, "Nachgelassene Schriften," ii. 45). See Samek; Shin. English Jewish Sheṭar, Dated 1286. (In the British Museum.)E. G. H. S. H.